No country on earth is organizationally prepared for a natural disaster, let alone a developing country. With an earthquake of 7.8, everywhere the inhabitants will rush to open spaces and sit there with a stunned gaze for several days. The emotional numbing, however, lasts considerably longer. It may take years before one gets back on track. Worldwide, television stations took full advantage of the new technical gadget: drone recordings. For days they repeated the overviews of drones that sometimes even entered exposed buildings and living rooms, recording everything relentlessly. In the event of a natural disaster, all privacy is instantly lost, the outside world apparently has the right to see it everything immediately (even though the Japanese architect / artist Shigeru Ban developed some well-thought-out solutions). 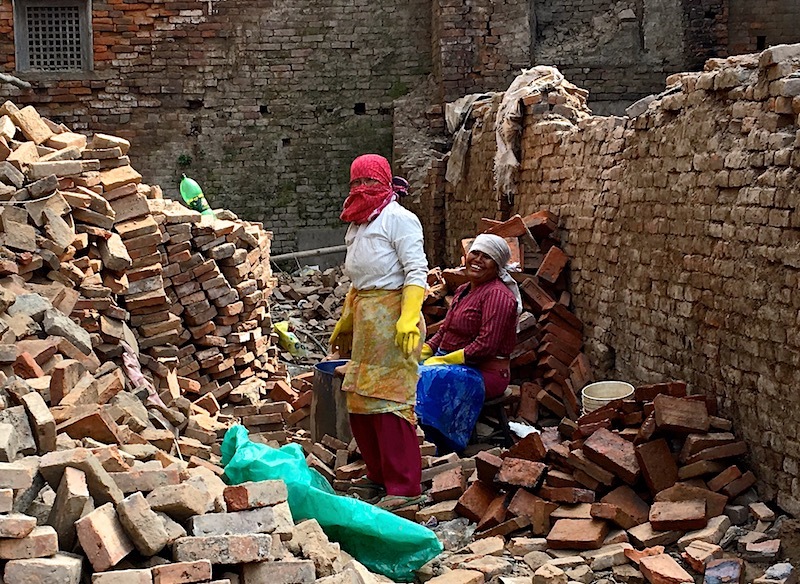 Within a month, Nepal was promised a billion euros in aid. 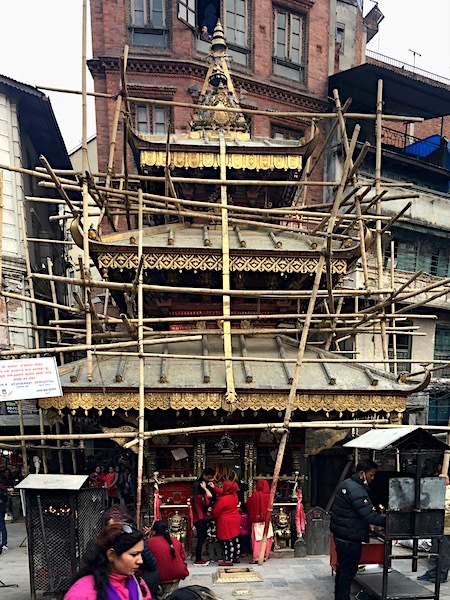 During the first weeks, Kathmandu was inundated by army units, secret services, auxiliaries, media, antique robbers, relatives seekers, etc. At the same time, panicked tourists fought themselves out of the country. The airfield could hardly handle the crowds and suddenly turned out to have been taken by the Indian army. The outside world freely moved into and out of the country. 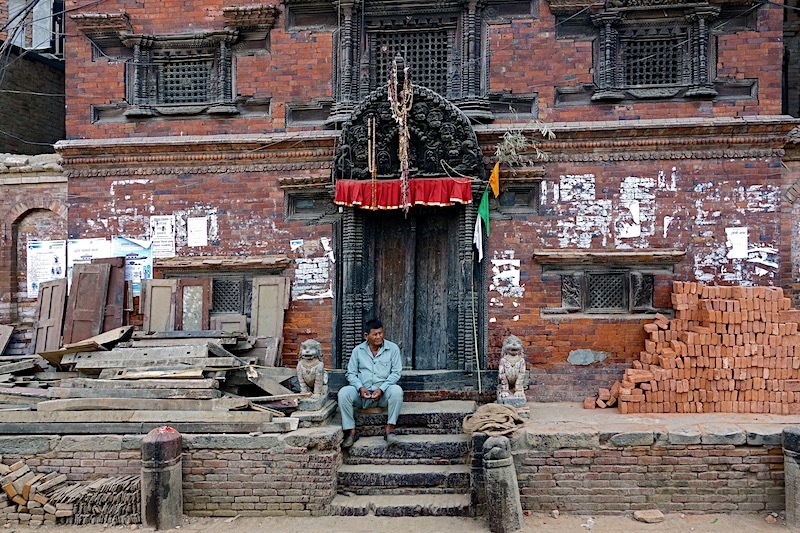 It took a few weeks before the Nepalese government regained control and intervened. A few examples. When a Dutch NGO team was expelled from the country within a week of its arrival, the Dutch media was baffled. When six British helicopters, having arrived in Delhi, were denied permission to land in the affected Nepalese hills, the world press reacted in bewilderment. 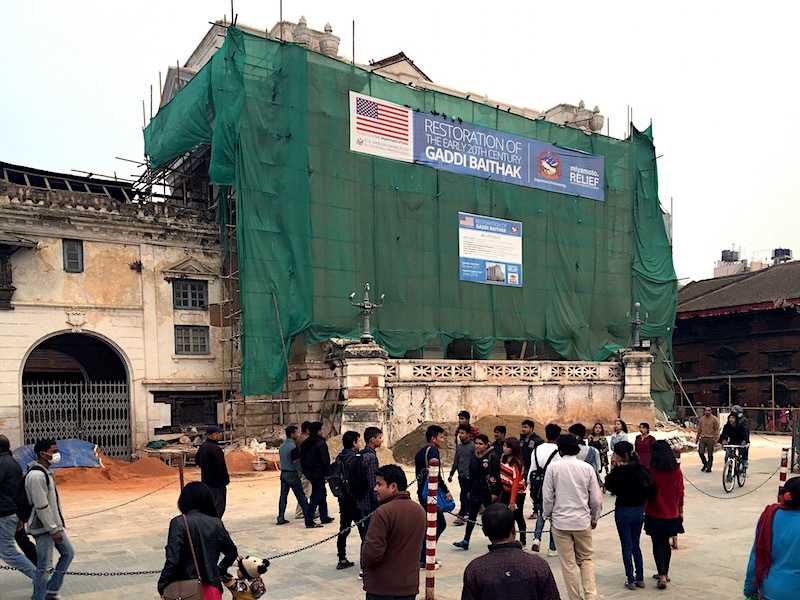 When the government announced that all collected and promised funds were to be remitted to the national emergency fund at the Nepal Bank, the billion instantly shrank. It may be useful to indicate how differently granting and receiving countries regard development aid. Whether through collection boxes, taxes or media campaigns for emergency help, the created image in the west invariably has an aura of selflessly doing good. When they just begin to grasp country and culture, they leave again. 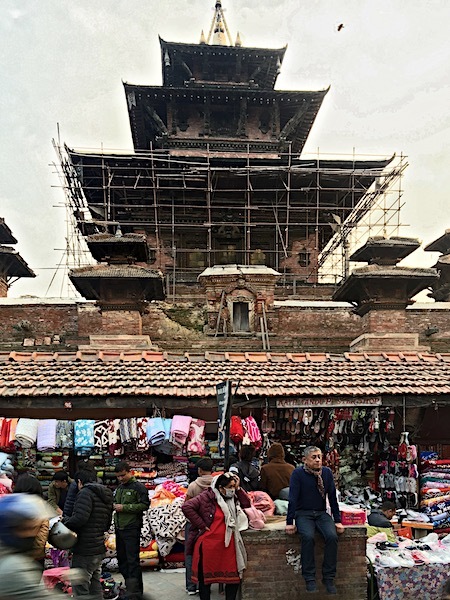 That Western donations ('gift without compensation’) do come at a price, has been known in Nepal for some seventy years by now. Right from the sixties onwards, poor, exotic Shangri-La has been visited by development workers (including the often silly kids from Peace Corps) on the principle: who wants to act well, acts. 'Make the most of the world!’ is their recruitment slogan to this day. 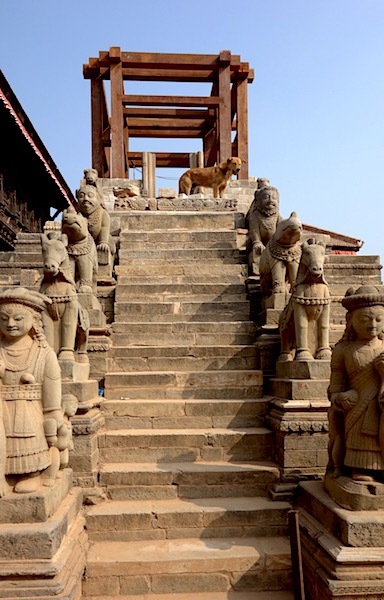 Still classic is the example of how West Germany, as a gift for the coronation of Birendra, offered to renovate the village of Bhaktapur in its entirety. On the drawing boards in Frankfurt renovation drawings were made as well as the guidelines for preservation, by German architects. Less than two years later, the villagers nightly demolished what German craftsmen had carefully restored during the day. In those years of enormous family expansions the population had no use for golden cages. 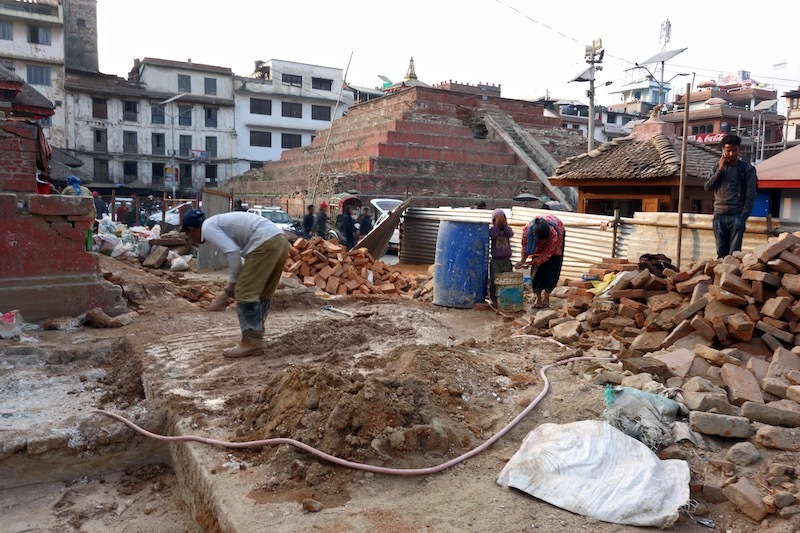 In the seventies, a foreign report was published entitled: ‘Can Nepal survive without foreign aid?’ The intrinsic arrogance is characteristic to this day. And let’s also mention how President Nixon – at the time of the Vietnam War – promised an annual amount of $ 100,000 in development aid. On the condition that those small hash shops where our youngsters got lost, were closed down. The fact that babas, sadhus and other traditionally-religious hindus had for centuries been getting their sonam that way, was neither known nor important. 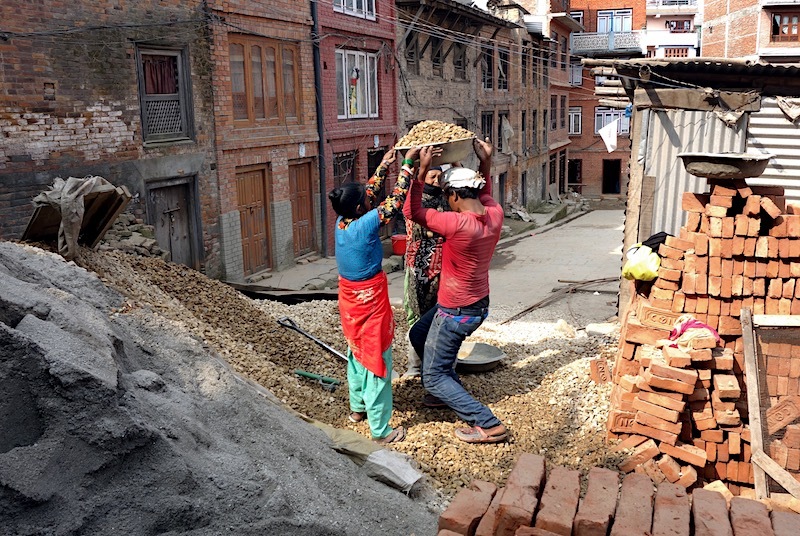 All anecdotal suffering, indeed, but hopefully it outlines the mentality that in all seriousness conceived titles as Can Nepal survive without foreign aid? 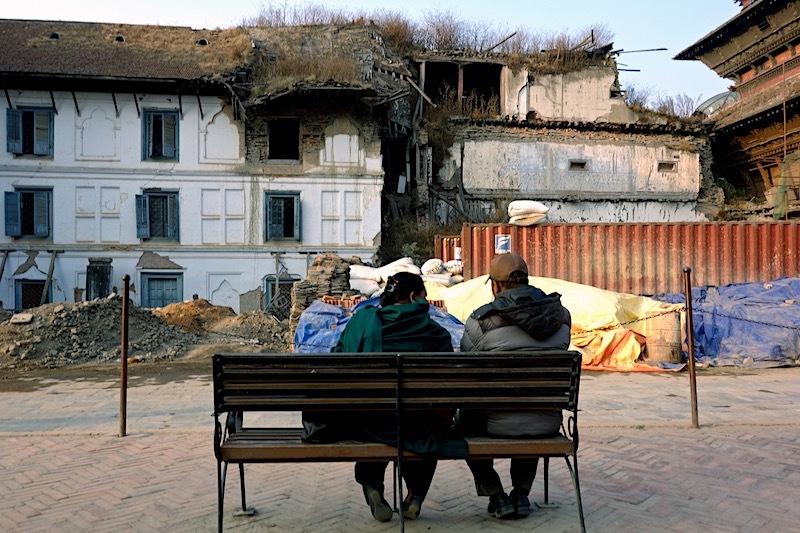 Afghanistan and Nepal are listed as the most corrupt countries of South Asia – the first being, however, nearly a permanent warzone. 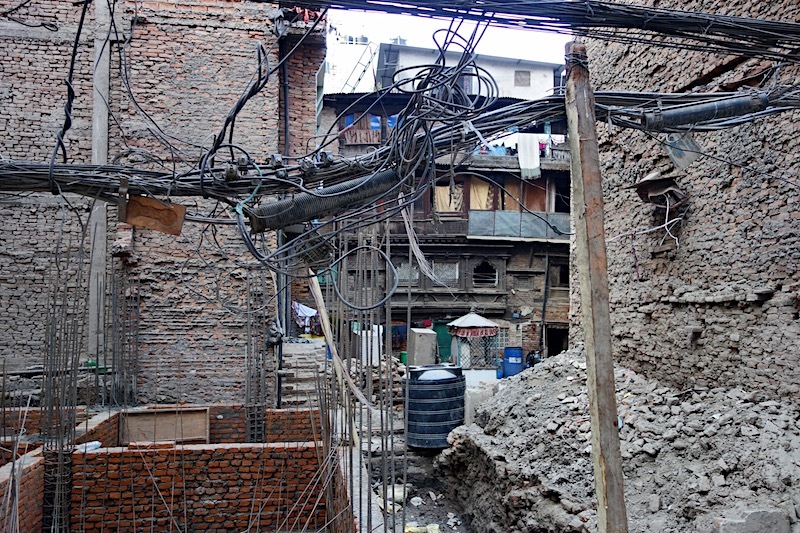 The corruption is so chronic because Nepal – roughly the size of England, with 29 million inhabitants – consists of three parts: cold high mountains along the border with China, lower mountain ranges, and a sun-drenched plain along the border with India. Consequently, it has very different cultures, spread over millions of valleys with countless, fairly isolated communities. It will always remain hard to achieve unity, let alone mutual trust. What might be most helpful is that Nepal is almost flattened between two bullies: China and India. It will always remain hard to guard your independence. 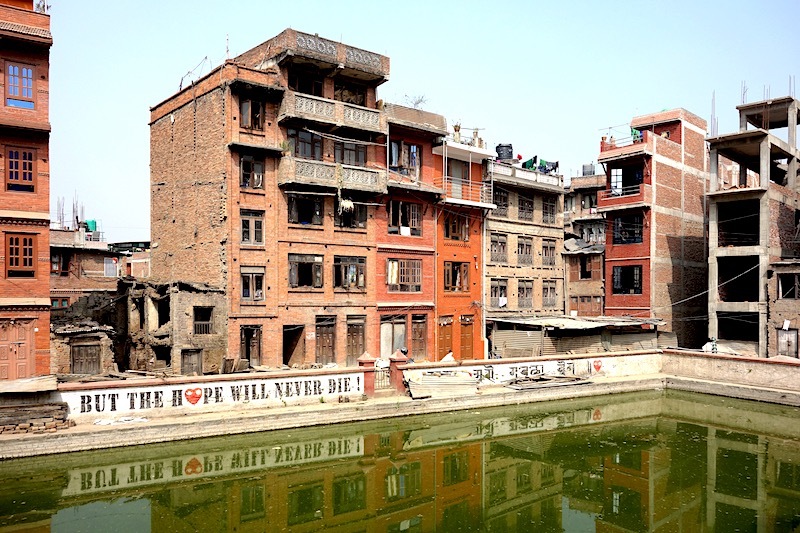 The Nepalese government has good reason for cherishing a slight paranoia. Once, neighbouring countries like Tibet, Sikkim and Bhutan were independent states as well. After Kathmandu announced a new constitution in 2011– despite fierce protests from India – the Indian Prime Minister Narendra Modi closed the border with landlocked Nepal. Almost instantly shortages of food, medicine, (aircraft) petrol, etc arose. Of course, international legislation categorically forbidding this, has been in existence for a long time, but no major power interfered. At the time, it did not suit their mutual geopolitical, military agendas concerning the Indian and Pacific Oceans. At the beginning of March this year, before his official inauguration as Prime Minister of Nepal, K.P. Oli invited the president of Pakistan for a two-day state visit; those of the other 'small' satellite states of India – Sri Lanka and Bangladesh – will no doubt soon follow. 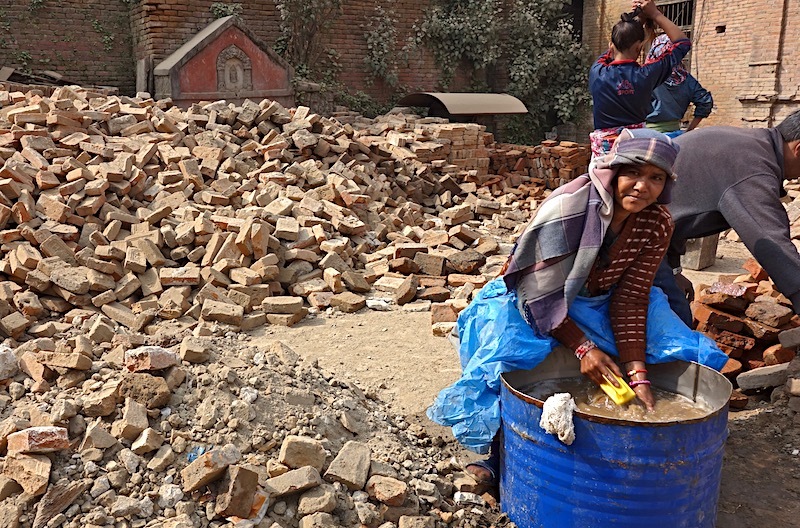 The first year after the disaster, hardly anyone undertook anything. By and large people placed a few corrugated sheets over the collapsed house and waited. After all, according to the media, a billion euro in aid lay waiting to be distributed. 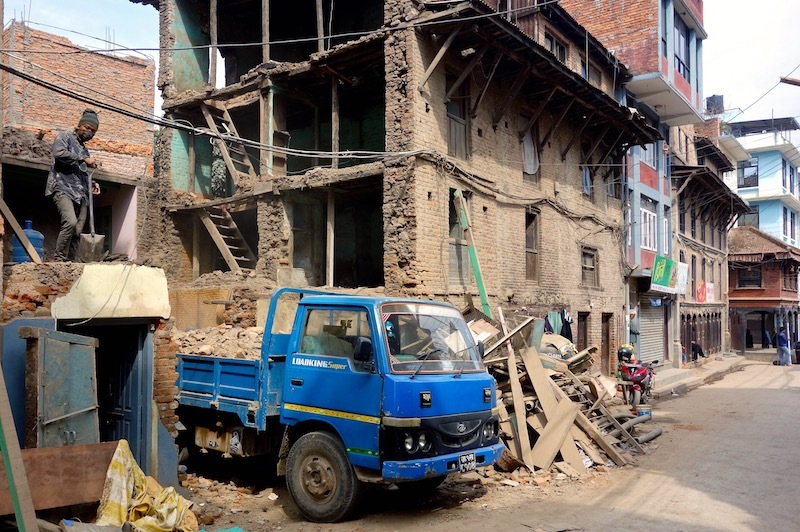 Foreign NGOs claimed loudly: give us a project and we'll do it! Most of them were stopped by the government: please, just deposit the money in our national emergency fund. 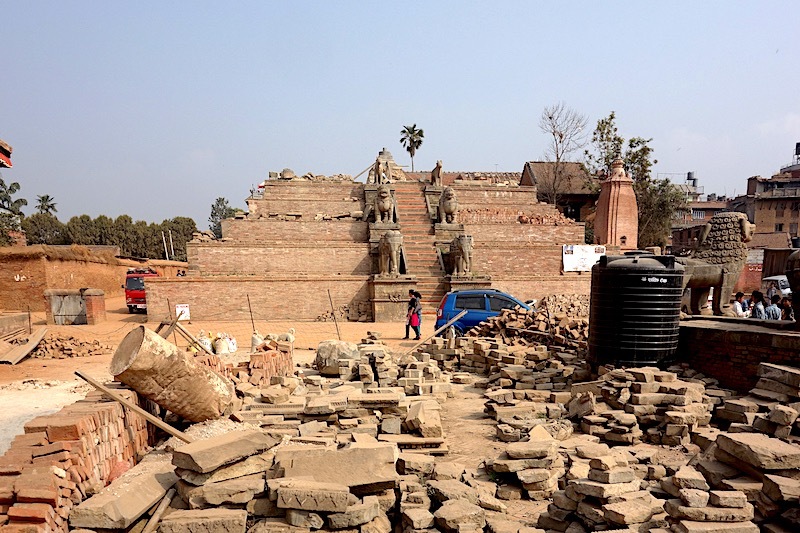 Only a few temples and stupas were allowed to be patched up or properly restored, usually with help of the devotees themselves and sometimes in consultation with Unesco experts. After six months the government announced that duped homeowners could take out a loan at 2%. The procedure, however, was so demanding (the land as collateral), complicated (papers, documents) and time-consuming (different offices) that most of them gave up. Whoever was able, started. Father, mother, sons and daughters – too bad for the painted nails. 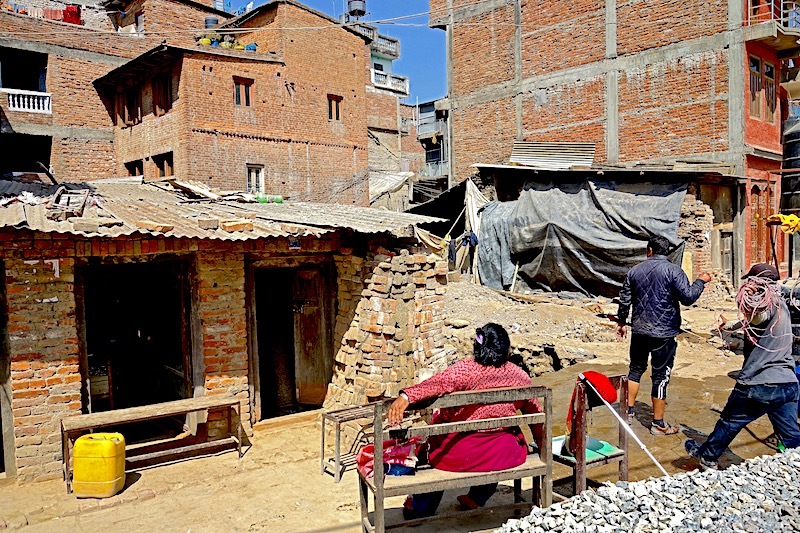 So far the government has had some 100,000 homes built in mountain provinces like Ghorka, i.e. two rooms of about four by six metres. No upper floor, no shed. The politicians realize that rain is worse than cold and promised that another 200,000 will be completed before the coming monsoon in July. 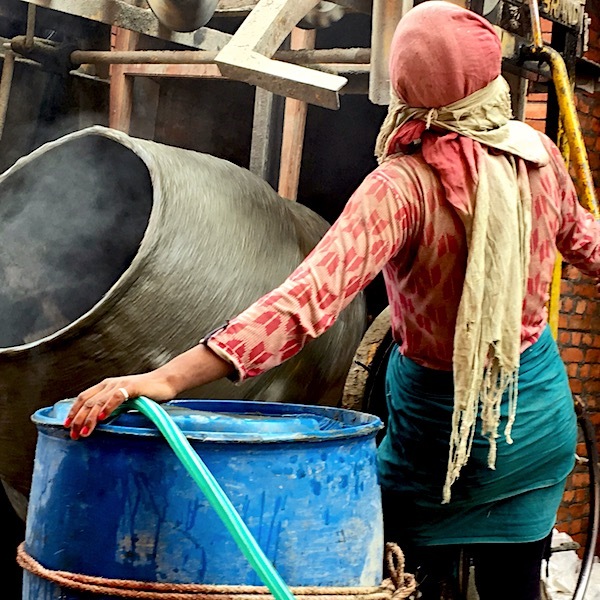 Apparently it can be done faster – despite the fact that many of the young men from affected hillside villages work elsewhere: Malaysia, Dubai, etc. Perhaps the government is stepping up the action, since the need will again be very visible in the capital during the rainy season: many working or studying children take their parents to their rented rooms during the rainy season. By the way, it is mainly the remittance money from young people working abroad that pulled the families back home through the past three years. In contrast to the banks, there is a Western Union or an 'underground' Hawala bank (hindi for trust) in every central small town. With a transaction number received over the cell phone and an identification card, the money can be collected much faster and cheaper. In the metropolitan valley the government does not renew any private home. However, concrete construction has been made compulsory. 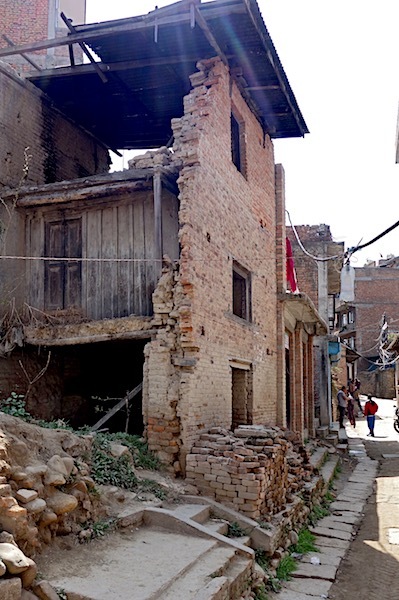 That stands to reason: mainly brick houses and temples did collapse, anything in concrete (since the fifties) still stands. 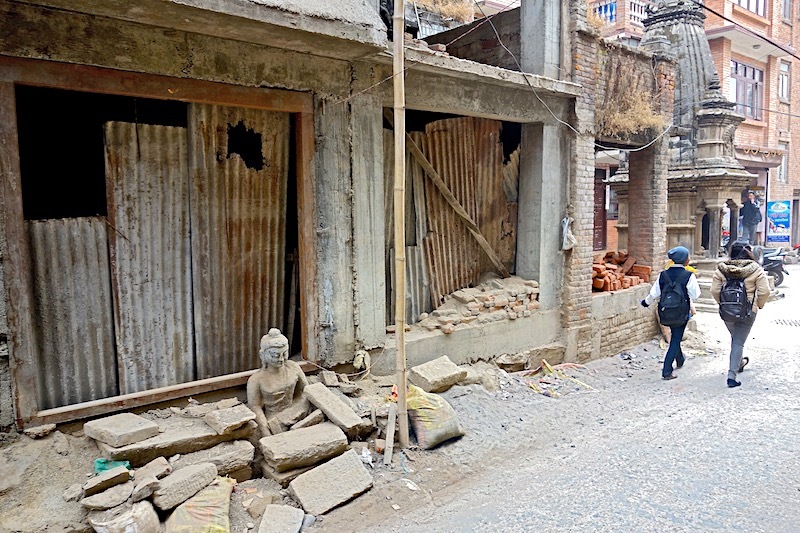 On the list of most earthquake-prone countries Nepal ranks eleventh. Based on the past, every 50 years a strong quake will take place and every 75 years a severe one. Especially Kathmandu is likely to be hit. 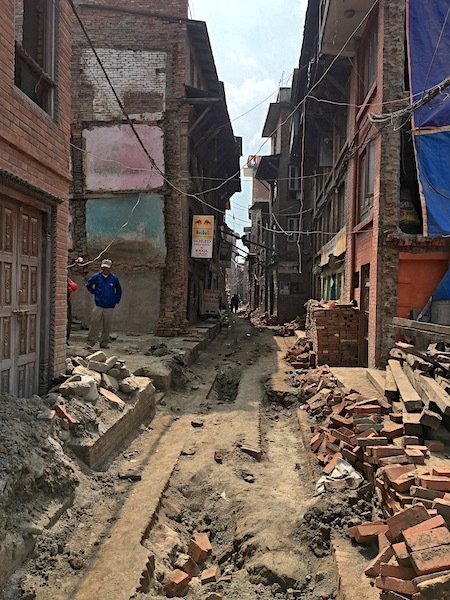 Under such seismological damnation you sometimes hear the reaction that such catastrophes actually provide opportunities to build better according to new insights. 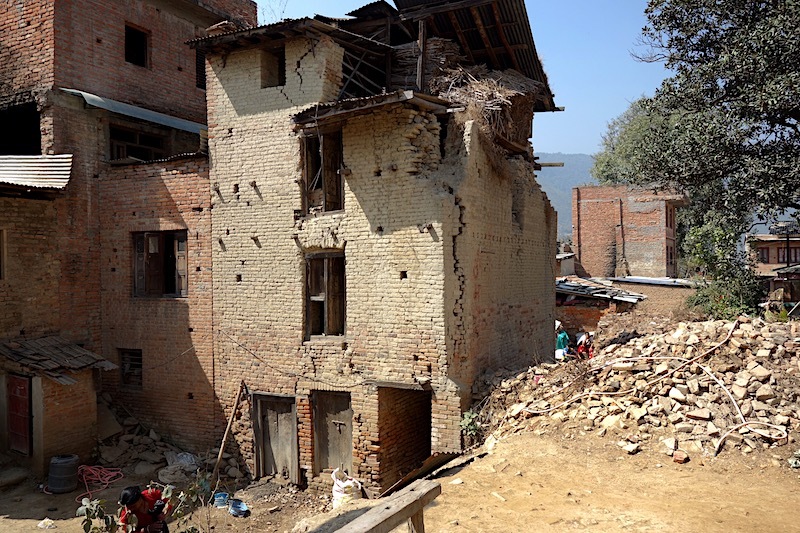 The current concrete brickwork, supplemented with clay bricks, will cause the, until recently, almost medieval valley to look less and less different from cities in other Least Developed Countries. In 2015 we were standing on the market square of the badly hit farming village Bungamati – and presently, three years later, we are back again. From a steel bench, a corpulent woman supervises the deliveries of cement, iron and wood. 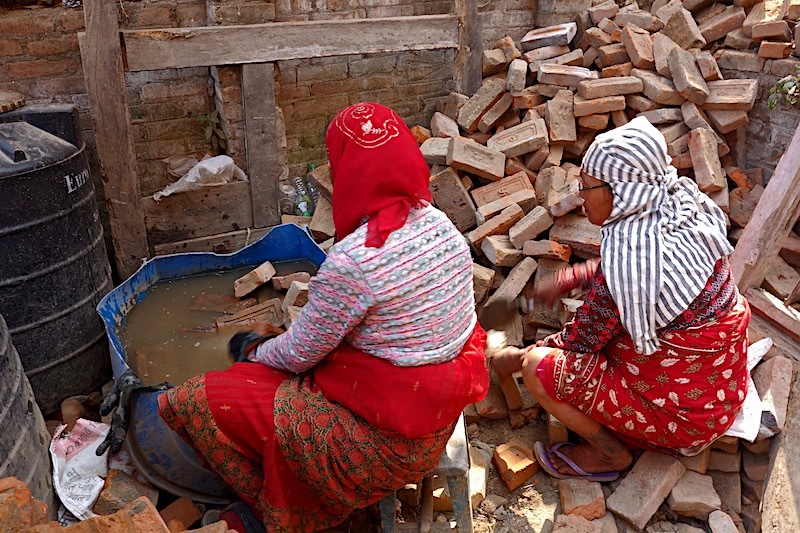 As with other collapsed properties, the bricks of the old house have been stacked, neatly washed, right next to it. Her sons have excavated the future foundation. With shovel and pickaxe. 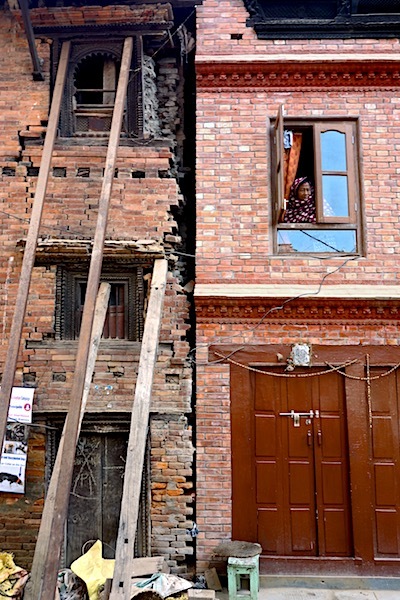 Because they cannot but respect the dilapidated state of the neighbours, they have to sacrifice a strip of twenty centimetres from their own land. 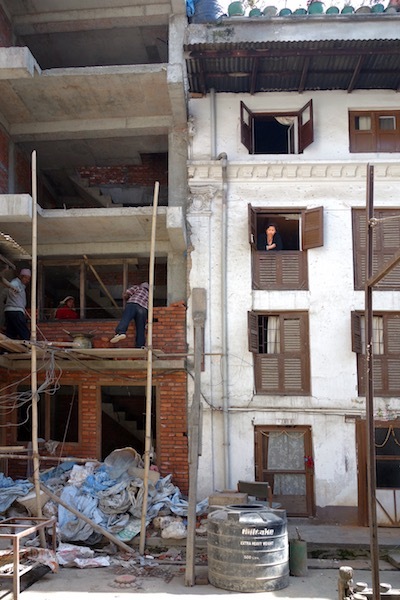 Hesitantly, I try to find out how come they do have the money to rebuild and their neighbours do not. The eldest son, however, is openly angry about it. First he got 50,000 rupees from the government to lay the foundation. Half a year later 150,000 to put up the walls. And finally, another 50,000 to install a roof. - If you don't have the money to build according to the mandatory design… you can nevertheless try to repair and restore a little here and there, no...? He eventually decided to sell a piece of his farming land. ‘That is a very difficult subject in this farming village,’ Kabir says later in the day. Behind him, his family house obviously knew far better days. He works as a teacher in a nearby town (English and environment), but during the planting and harvesting seasons he works on the land with his parents. 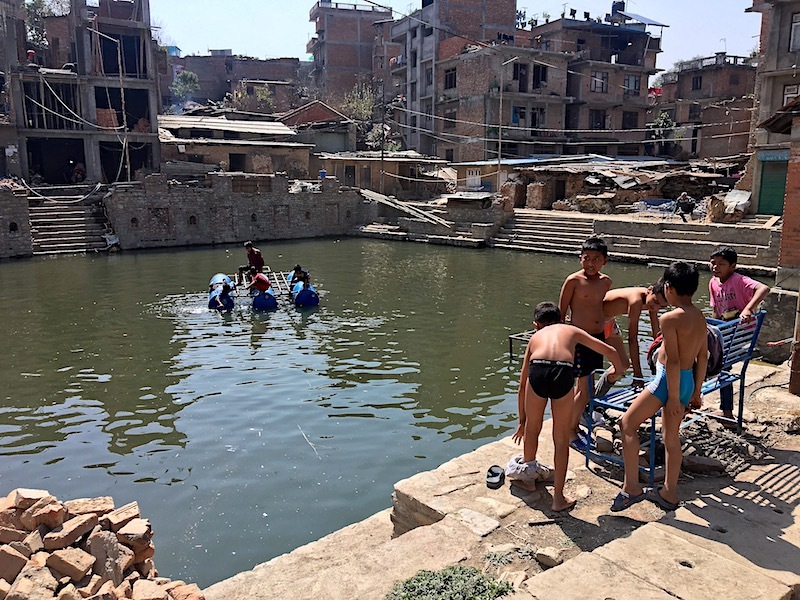 Despite all the misery caused by the earthquake – seen here in the background – these kids have fun on water of which an accidental sip would prompt us to deflate, if not fall flat. For centuries only the strongest genes have been surviving in such poor villages. But it is good to see their pleasure in the midst of all this misery, for that is the course of things.